Two recent posts from the Korean's favorite North Korea blog Nambukstory were very interesting. If you don't know, the proprietor Joo Seong-Ha of Nambukstory is a graduate of Kim Il-Sung University and was on track to be an elite officer in North Korea, until he defected the country. He was actually captured in China and sent back to North Korea, suffered in a gulag for several years, then defected again and finally made down to South Korea. Then he became a reporter for Dong-A Ilbo, one of the most read newspapers in South Korea. As evident from the posts below, Joo is not very sympathetic to Euna Lee and Laura Ling. The Korean does not necessarily agree with everything Joo says. However, they are certainly worth a read. 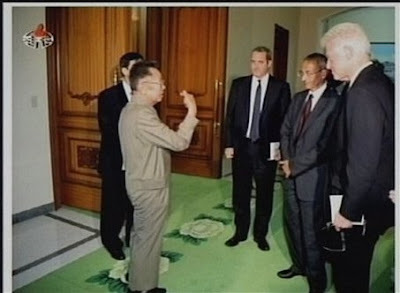 Former U.S. President Bill Clinton visited North Korea unannounced. The morning paper would be flooded with the meaning of the visit and different analysis, so I will save my words on those topics. Instead, I will write about something that likely would not come out on newspapers or television news. As we have seen many times over, it appears that North Korea again achieved its objectives. Now that they were successful in luring someone as big as Clinton, the only thing remaining for them is to maximize the effect of the visit. There is much analysis about whether Kim Jong-Il would send a message to Obama via Clinton; I think Kim would. In fact, Kim has been in love with the U.S. for a very long time. But love is not something that can blossom when only one side of the deal holds the love. Kim Jong-Il would like to align his regime with the U.S. as long as his regime is maintained, but the U.S. does not want to align itself with an authoritarian regime like North Korea. In other words, the interests of the two parties conflict. Keeping up with America's demand for human rights even at the most basic level -- shutting down the concentration camps for political prisoners, for example -- would shake the foundation of the North Korean regime. In addition, Kim cannot get out of his father's shadow. Because he grew in that shadow, it is difficult for him to transition to capitalism. But Kim knows that if he cannot normalize relationship with Obama administration, which is very conciliatory toward North Korea, normalization of relationship with America is just a pipe dream. So it appears that Kim would try to send some form of enticement to American government somehow. And -- now for the topic about which I really wanted to write -- how would North Korea propagandize Clinton's visit to its people? This propaganda happens in a way that is different from the Rodong Shinmun [newspaper] or Joseon Jung'ang TV. It actually happens through internal lectures geared toward the people. In other words, the propaganda is not shown externally. "Finally, American bastards kneel before Dear Leader." Of course the precise expression may differ, but the general framework would not be very different. When I was attending Kim Il-Sung University, there was a constant stream of lectures from the Chief Lecturer of the Central Party -- in other words, the best lecturer in North Korea. He is a talented man, extracting the best possible analysis out of any given situation. Having been educated by such a person for years, I have a rough guess of how he would play it out. North Korea consistently relies on the "Porcupine Theory," which goes likes this: "There are many things for a tiger to eat in the mountain, so why would it choose to hunt a porcupine?" North Korea likes to compare itself to a small but spiked porcupine, as all of its people can be mobilized and are generally military-ready. It would also connect Clinton's visit to the missile tests in April and the nuclear weapon test in May: "At first, Obama underestimated us and said dumb things, but Dear Leader taught him a lesson. Once we fired a satellite and tested a nuclear weapon, America has gotten scared. Eventually, it gave in and paid a visit to the Dear Leader. Clinton is no small fry; he was the Democratic Party president before Obama. America sent the biggest personality it could send." Or so the lecture would go. Oh, and I would be remiss if I forgot to mention this -- the education about the greatness of Kim Jong-Il: "Our Dear Leader's courage is simply the best. In the face of adversity not even his eyebrow flinches, not even against America. He toys with the world's greatest power. The Earth turns on the axis of Dear Leader's willpower." And at this point disparagement of South Korea would come in, like this: "The puppet traitor Lee Myung-Bak became blindsided after trying to follow its master's will. He was wagging his tail while not even knowing what his master was thinking of, and now the situation is out of his hands. He must be getting sick thinking about how to curry favor with us. But we will not be that easy. Until he begs for mercy for his past misdeeds against us, we will never engage him." They need to set it up this way so that in the future when the North-South relation becomes strained, they can propagandize: "They want to beg for mercy, but we are not talking to them to teach them a lesson." Then the question is whether the North Korean people would believe in this kind of lecture. Unfortunately, I think most would. They have been fooled for the last several decades, but did not necessarily get smarter about this. Of course, no one would believe them if the regime announced that it would give regular rations, but this is a little different. Because Clinton did appear after the missile and nuclear test, it does look like the tests caused Clinton to come. In my view, because North Korean people are desperate enough to put their hopes on straws, they would believe the regime's propaganda and begin to have some hope that things will get better somehow. At any rate, it looks like the journalists would come back to America with Clinton. I recommend reading the post that I wrote on March 19, "Do the two detained American journalists deserve sympathy?" The analysis was written exactly two days after the journalists were captured. In the end, just like I predicted, they spent several months at a hotel (or a guest house, which is better than a hotel,) in North Korea and came back just fine. In that post, I asked what would happen if the captured people were South Koreans. And as if the North Korean regime decided to show me what would actually happen, a South Korean worker was detained in Gaeseong about a week after I wrote that post. Now, the time has come when the difference between the "citizens of the continent" and South Koreans starkly reveals itself. I am reminded again that a country needs to be strong. This morning, many morning papers carried on their first page the pictures of American journalists reuniting with their families. CNN is also repeatedly showing the video of the journalists deplaning as well as this picture. I understand that the images are newsworthy, but I am not very pleased about seeing these images over and over again. The American journalists must shed their martyrdom image. Strictly speaking, they are illegal border jumpers -- not to mention the fact that they were caught fooling around the border of the scariest country in the world. They are lucky to not have gone through worse. Their situation is only special in that they were caught in North Korea, since many different places in the world would not take kindly to illegal border jumping. America is no exception. I would like to suggest the American press that before endowing the journalists with the halo of martyrdom, look first at how the people who were attempting to illegally cross the U.S. border via Mexico are rotting in its own country's prisons. The journalists so far did not say much, but surely there will be many interview requests forthcoming. In those interviews, I really hope the journalists don't say they were having such a hard time. The reporters would know what North Korean defectors would go through if the defectors are caught and sent back to North Korea, because the reporters investigated those stories themselves -- although it may be silly to compare the status of American citizens and that of North Korean defectors. But take for example Chinese citizens, who are foreigners to North Korea as much as Americans are. I have seen with my own eyes Chinese persons being arrested after having illegally crossed the Duman River [which forms NK-China border]. They spend several months in the same prison that keeps the defectors, receiving insults and food that is fit for pigs -- although they were not beaten, and did receive more food than defectors. Given that situation, the journalists received a special treatment. In what country in the world are illegal border jumpers kept not in prison but in a "guest house" or a hotel, with exercise and leisurely walks being allowed? They even managed to call their family through international call. Even America does not guarantee human rights that way. They received the best possible treatment that illegal border jumpers could possibly receive, and they should be thankful. In addition, I am sure many were wondering upon their return: what are in those bags? They certainly must have been empty-handed when they were captured, but through a little over four months of North Korean life, they now have luggage worth two or three bags. I thought about what those bags are carrying as well -- they seem a little too big for clothes and makeup. I thought it may be possible that North Korean regime gave them some gifts for the reporters' family, in consideration for the mental anguish they went through. North Korea is fully capable of contriving such a show. If that were the case, the journalists may set a record as illegal border jumpers who received several bags of gifts on the way back. Even if they received no more than some clothes, they were treated extremely well -- especially if they received that much to fill those bags. When I was arrested and sent to North Korea, I wore the same piece of half-sleeve t-shirt and pants that I wore during summer and shivered in bitter cold in forced labor during winter. I could not wash my clothes because I only had one set, and it was not as if I was in a situation to wash clothes. North Korea is a barbaric country like that. The journalists should feel fortunate that they received a treatment that was much, much better than that received by North Korean people in such a country. The journalists did not say much yesterday, but they stated that every day, every moment they feared being sent to a gulag. Although it appears clear that they were worried, I do not feel very inclined to believe the words "every day, every moment". If they were truly gripped by such fear, they have no right to work as journalists, as they lack the most basic judgment of reality. It does not take a journalist to make a reasonable guess that there will be no harm, physical or otherwise, to a person who is definitely going to return to America and testify about how they were treated. And it is laughable that they were thinking about gulags when they managed to make international phone calls while living in a guest house. Guest houses are better than hotels in North Korea; "guest house" is the name for summer and winter homes for Kim Il-Sung and Kim Jong-Il. Currently, many of Kim Il-Sung's guest houses are empty. Also, safe houses by special branches of the government are also known as guest houses, which also have the best amenities in North Korea for VIPs. They may have been mentally anxious, but no amount of money would buy the experience of staying at guest house in North Korea. And I really hope that they are observing the result of their adventurism. Above all, Kim Jong-Il has been loving it since they were captured. One only has to look at Kim's huge grin since the Clinton visit. Obviously, there will soon be propaganda about how America bowed to North Korea. Thanks to the journalists, Kim Jong-Il can deceive the 20 million North Koreans and mobilize them into forced labor. I only wish that the journalists reflect upon the sins created by their playing heroes and upon the special treatment they received, and live on quietly. But if they further show up on television trying to drum up sympathy by shedding tears and creating an image of a martyr, that would be just unbearable to watch. They really do not have the right. 1. Couldn't the journalists cry a little after having been reunited with their family after so long? Answer: I was not commenting on the crying while meeting their family. Of course they can cry after being separated for a while. All I asked was for them to refrain from showing up on media and pretend they deserve sympathy. 2. Didn't the journalists go through a lot, such as mental stress? Answer: Of course they must have gone through a lot. Everyone feels stressed when the environment changes; it happens at your work too. I did not say they were not allowed to feel stress or anxiety while being under arrest in North Korea. 3. Isn't it too ungenerous to criticize when they were trying report on North Korean defectors? Answer: Reporting on North Korean defectors in China and jumping the North Korean border to get a nice picture are two different things. The journalists themselves said they voluntarily crossed the border. (If North Korea kidnapped them, America would have never reacted this way.) Could they really not report on North Korean defectors if they did not step on the North Korean soil along the border? Such senseless action makes me question if they truly were motivated by concerns for North Korean defectors, or by a desire to make their own names. Already the journalists are saying things like there were rocks in the rice given in North Korea, or how they missed fresh fruit and vegetable. I am totally blown away. It is a country that does not even really have refrigerators; such complaint is more fit for tourists. Were they expecting to be treated like heads of states? Meanwhile, North Korean people are having a hard time eating rice to begin with. How good of a treatment was it necessary for them to not say such things? Thank you, I wanted to ask you for a new translation, because with the release of Euna Lee and Laura Ling, I was sure he had something to say. I was a bit Shy to ask. :D I can't wait to read it. It's already on my night stand!!! "I would like to suggest the American press that before endowing the journalists with the halo of martyrdom, look first at how the people who were attempting to illegally cross the U.S. border via Mexico are rotting in its own country's prisons." Typically border crossers into the US are not detained for long unless they've committed other crimes on US soil. We usually send them back home as quickly as possible. You see, in America you don't have to come visit us to be thrown in jail. We'll actually come visit your country and haul you off to a 5-star facility like Guantanamo. The bags likely contained items that were sent to Laura and Euna via the Swedish ambassador to North Korea, Mats Foyer. Laura Ling actually had a list of items that she requested, including clothes, and her mother sent the parcel immediately to the embassy of Sweden in Pyongyang. I think he is little bit to harsh on the two scared women. We all know what is happening to arrested North Koreans. Anyway they were doing documentary about those poor people and they are surrounded by smart people, I think when they will start doing interviews they will do anything to help the case. The first thing to sort out is to put pressure on China to not send people who shall be treated as asylum seekers back to North Korea where there are punished beyond se severely that is imagination. I love your translation. I am reading bogs about North Korea but I am limited only to English and Polish* languages. I know you are busy man but, maybe, would you mind to look if there is anything worth translating about ‘newspeak lectures’ and about him being arrested please? *Please do not ridicule it, as ex-communist state there is quite a lot of information about the north in my native language. And again. Thank you very much for time thank you took to translate this article and for all your answers in the past. Just found your blog, and I am glad I did. I have learned a lot more about Korea through you than from my korean friends. I also think it's time for this story to be put at rest. Too much publicity in a angle that is not the best to exemplify the whole borders-related issues. Coming back for more of your insights too. By the way, the gyopo makeup entry was very interesting. There's a lot going on these days about ethnic surgery.